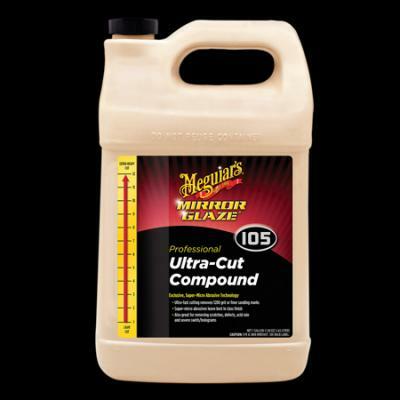 Ultra-Cut Compound rates at 12 on Meguiars' revised (to accomodate this compound) aggresion scale of 0-12. Compounds usually come in only two flavors ... lighter and heavier ... but this material is another story. The additional aggresion resulted when Meguiars decided to make a compound that could safely be used by hand. It has been very difficult to remove compounding marks by hand until M105 and its matched Cleaner/Glaze, M205, Ultra Finishing Compound came along. This compound has garnered praise from all comers as a remarkable compound, whether used by hand or machine. Select a 100% wool pad for machine use but M105 is one of the few compounds that can be used by hand and not leave marks too big too be effectively removed. Follow with the matched M205, Ultra Finishing Polish for a flawless finish.